When the 63rd Annual Greater Kansas City Science and Engineering Fair took place at Kansas City’s historic Union Station in March, Terracon was there supporting students. The annual fair is by Science Pioneers, a non-profit group whose mission is to create innovative and supportive education activities that will encourage the youth of Kansas City to understand and use science and critical thinking in their careers and everyday lives. The Terracon Foundation sponsored an academic award: the Senior Environmental Sciences/ Renewable Energy Award. The first place winner was Katherine Calhoun, a senior at Shawnee Mission West High School. Triton Wolfe, a senior at Olathe North High School, won second place. Joe Marsh, P.E., director of Employee Development and Wellbeing, represented the Terracon Foundation during the Awards Ceremony. Both students received scholarships. Two Lenexa staff members, Brett Larsen, P.E., senior geotechnical engineer, and Angela Caw, project manager, attended a “thank you” luncheon hosted by Science Pioneers for Terracon the day after the fair. They had the opportunity to talk with Science Pioneers staff and to view the students’ presentation boards. 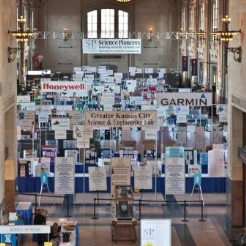 The Greater Kansas City Science and Engineering Fair is the largest in the region. More than 1,300 students, in grades four through twelve, from across the Kansas City metro took part.